(6-Pack) Bungee Cord With Carabiner Hook Straps, 36 Inch Cord, Overall Length 42 Inch, Stretch Cord For Luggage, Bike Racks, Tarps, Uv Resistant. The Supply Guru Bungee Cord With Carabiner Hook are compact functional design, can be used with one hand, plastic molded grip for strength and security, UV resistant cord jacket, tough weather-proof nylon. 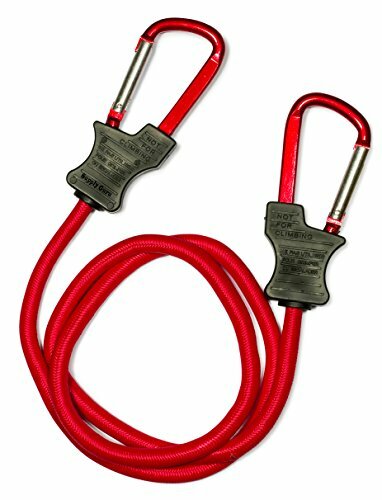 Strong steel carabiner hook, no scratches or damage to anchor points, stretches easily over 6 feet with excellent tensile strength. Carabiner hook and safety spring lock to keep it in place, and prevents items from unwanted detachment while in use. Bungee cord has innumerable uses in the home, workshop, camping and more. And can be used in a wide variety of applications - bundles, camping, cargo racks, garages, household, ice chests tie-downs and yard work. 42" length relaxed - stretches to 72" (including hook) bungee cord diameter: 5/16-inch (8mm), carabiner hook 2-1/2" inch. note: these bungee cords are not recommended to be used in mountaineering, rock climbing, ice climbing and high-altitude games for your safety, max load 100 lbs. Great value 6-Pack Bungee Cords, 42" length relaxed - stretches to 72" (including hook) cord diameter: 5/16-inch (8mm), carabiner hook 2-1/2" inch, and 5/8" opening. bungee cord, strong steel hook, no scratches or damage to anchor points, stretches easily over 6 feet with excellent tensile strength. compact, functional design can be used with one hand, plastic molded grip for strength and security, UV resistant cord jacket. Can be used in a wide variety of applications, bundles, camping, cargo racks, garages, household, ice chests, tie-downs, and yard work. If you have any questions about this product by Supply Guru, contact us by completing and submitting the form below. If you are looking for a specif part number, please include it with your message.